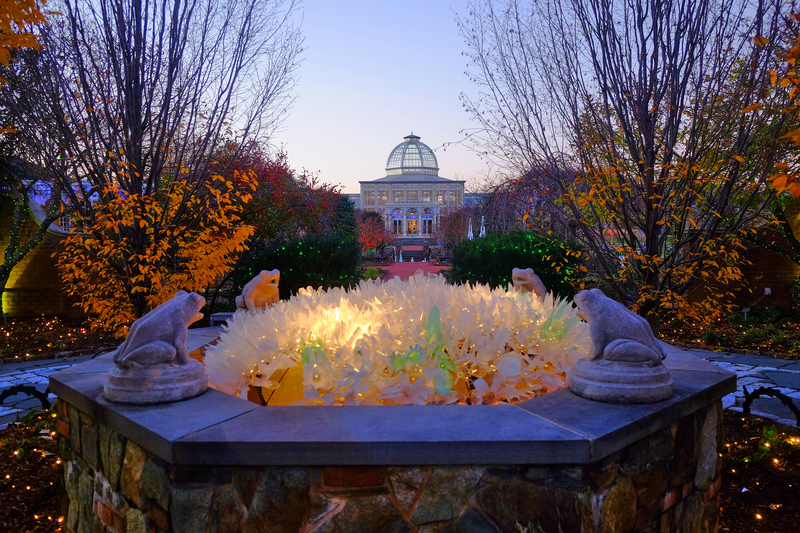 This year’s Dominion Energy GardenFest of Lights 2015-2016 at Lewis Ginter Botanical Garden is proving to be very popular, especially with the unseasonable spring-like weather! We are entering what are traditionally the busiest nights of the season, starting when local public schools let out (Friday, Dec. 18 this year) through Wednesday, Dec. 23 (the Garden is closed on Dec. 24 & 25). Although we plan for larger crowds, the weather is a huge factor and warm temps can really bring people out. During this busy time, we thank you in advance for your patience. Please know guest safety is our number one priority. Buy tickets in advance. You can purchase online avoid waiting in ticket lines. You can also purchase tickets at the Garden during the day (9 a.m. – 10 p.m., except Dec. 24 & 25 when the Garden is closed). Carpool! It’s always a good idea. Come early. To best manage our high visitation, we encourage arriving at 4 p.m. Please note GardenFest admission fees go into effect at 4 p.m. When you come early, you can watch the magic as the sun sets and the lights begin to shine. Look at alternate routes. The Garden is on the corner of Lakeside Avenue and Hilliard Road. During busy times, traffic can back up on Lakeside Avenue. Look at Hilliard Road as an alternate route. Like Lakeside, Hilliard intersects with Route 1. Hilliard also turns into Glenside Avenue, with access to major thoroughfares such as Staples Mill Road, Broad Street and Interstate 64. Be patient with parking. When parking lots are full, the Garden will close the gates to incoming traffic for up to 30 minutes, allowing time for some guests to leave. If gates are closed, you may want to check out lights in nearby Lakeside/Glen Allen neighborhoods and return later. If you choose to park near the Garden and walk in, please be courteous to our neighbors and use caution: watch out for traffic, keep an eye out for children, bring a flashlight and please be aware the Garden is not responsible for traffic control off-site. We are honored so many people choose to spend their time at Dominion Energy GardenFest of Lights. Although we’re closed Dec. 24 and 25, the Garden re-opens Dec. 26 and GardenFest runs through Jan. 11. And here’s a bonus tip: Dominion GardenFest of Lights is a great way to get those visiting friends and relatives out of your house during the holidays! Beth Monroe is public relations and marketing director at Lewis Ginter Botanical Garden. She feels honored to be part of a team connecting people and plants to improve our community.